The grand old autoroute running from Provence to Paris by way of Lyons provided the worst driving experience of our trip--rather like an extended version (with extra trucks) of the New Jersey Turnpike. We had left Sètes rather early, but then got lost in the mess of roads leading into the Camargues, so our lunch in Aigues-Mortes left us still by the Mediterranean by early afternoon with at least ten hours' driving to Normandy. 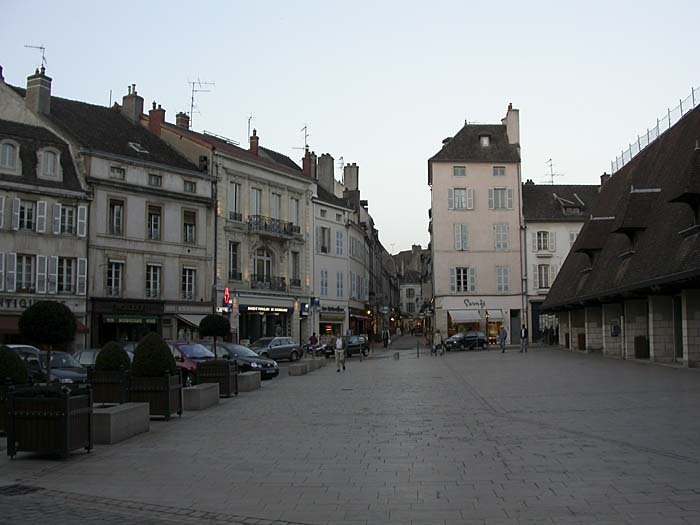 The solution was a comfortable overnight stop in Beaune, a Burgundian town famous for its Hotel de Dieu and its wines. We chose it for its proximity to the autoroute, the chance to stay in a hotel chain that provided a bit of English-language coverage of the war in Iraq, and as a staging point for our drive to the north coast. We walked the town, chose a much too quiet, overpriced restaurant near the church, had a rather uncomfortable dinner, and then wandered around lost for an hour before retracing our steps and finding the way back to our hotel and its cable television. Next morning we took the time to walk back into town to visit the church which had been closed the previous evening. A small market provided a bonus. Then it was time to point the Citroën Picasso towards Le Havre, Honfleur, and to our next longer stop in Étretat on the coast of the English Channel.